The closer did it again. 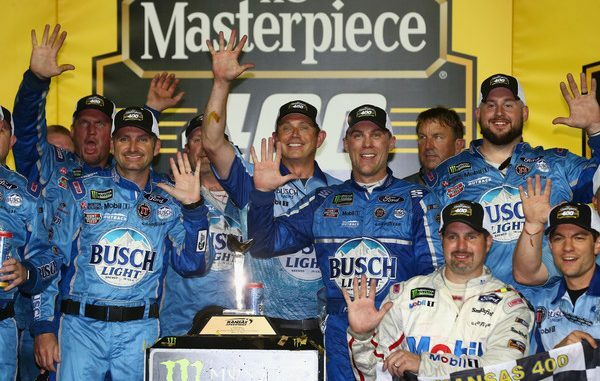 Kevin Harvick took the lead from Martin Truex Jr. with a lap and a half to go Saturday night to win the Monster Energy NASCAR Cup Series KC Masterpiece 400 at Kansas Speedway. It was the Stewart-Haas Racing driver’s 43rd career win, his second consecutive, and his fifth of 2018. It was not the dominating win that Harvick has staged in the past however. Harvick led from pole and led 79 laps but was fighting an ill-handling car in the middle stages as a dominate Kyle Larson seemed to have everyone covered. Larson who had started at the rear of the field after a spin in qualifying Friday led a race high 101 laps, won Stage 2, and had a lead of 3.5 seconds at one point, but on a restart with 25 laps to go it started to come undone. In a race that had only one competition caution on lap 30 and two cautions for the end of Stage 1 and 2, the first caution for an on-track incident came on lap 236 when Daniel Suarez, two laps down, got loose and made contact with Alex Bowman in 14th. The leaders pitted, and Larson was leading on the restart on lap 242, 25 laps to go. Ryan Blaney- who won Stage 1- pushed Larson to the lead but Blaney got loose exiting turn 2. Harvick was on the outside and by the start of the next lap had the lead. Joey Logano had momentum on the outside and took second. Larson was third. Blaney moved up and took fourth; he was looking for third from Larson on lap 247 when the two got together on the frontstretch just past the start-finish line; Blaney cut a right front tire and ended in the wall in turn 1. Caution came out. Blaney was done, Larson continued. Most of the leaders pitted, while six cars stayed out; Logano, Martin Truex Jr., Erik Jones, Denny Hamlin, Ryan Newman and Chase Elliott. Larson was among the leaders who had come in, but he had to pit again when the crew reported they had not got all the lug nuts tightened. Green came out to start on lap 251, 15 to go. 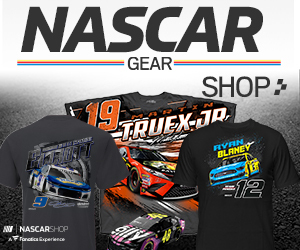 Truex took the lead while behind William Byron got loose exiting turn 4 and went nose first into the outside wall sweeping up Clint Bowyer; Byron’s car went up and over the car of Newman. Also involved when the smoke settled; Matt Kenseth, Ty Dillon, Jamie McMurray and Chris Buescher. The clean-up forced NASCAR to throw a red flag for just over 13 minutes. After the red flag was lifted, several pitted including Harvick. The restart came out with 9 laps to go. Truex, who had stayed out and took the lead but Harvick who had restarted sixth, was able to charge by on the outside with fresher tires and soon had second. With two to go Harvick was at the rear of Truex and was slightly ahead; as they came to one to go, Harvick had the lead. From there Harvick was able to hold off Truex for the win. Paul Menard was sixth with Jones, Kurt Busch, Aric Almirola and Kyle Busch rounding out the top 10. Harvick’s fifth win in the first 12 races of the season hasn’t been done since 1997 when Jeff Gordon accomplished the feat. Next up is the Monster Energy NASCAR Cup Series All-Star Race at Charlotte Motor Speedway next Saturday night. The next points race for the Cup series is the Coca-Cola 600 at Charlotte on May 27.